First Man, the brand new movie starring Ryan Gosling has just got some out of the world new IMAX poster artwork. The film, directed by Damien Chazelle, reunites him with his La La Land star Ryan Gosling for the fascinating true story of the life of Neil Armstrong as the USA prepares to set foot on the moon. 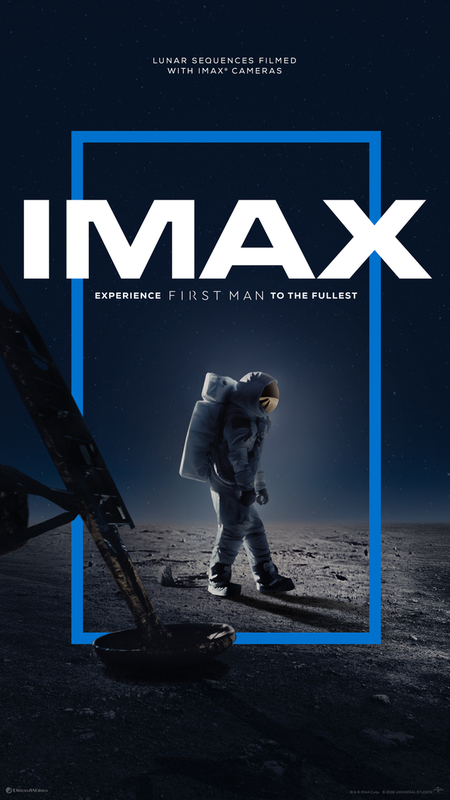 The new exclusive IMAX brand film poster has been released featuring the film’s lunar sequence (filmed with IMAX cameras). First Man is set to land in cinemas on October 12th 2018. In the compelling story of NASA’s historic mission to land a man on the moon starring Director Chazelle captured the breathtaking lunar sequences of the film with IMAX’s extremely high-resolution 2D film cameras. There is no better, or more stunning way to experience this scene other than in IMAX. In addition to delivering their trademark crystal-clear images, the picture will expand in the lunar sequences by up to 26% more than standard screens. This will only happen in IMAX, allowing moviegoers to experience the film the way it was truly intended. Watching these awe-inspiring images on the biggest screen with IMAX’s heart-pounding and unique sound technology means that audiences will feel like they are being transported to the moon. They will feel fully immersed in the story. The film focuses on Neil Armstrong over the years 1961-1969. First Man is pitched as a visceral, first-person account that will explore the sacrifices and the cost, both on Armstrong and on the US nation, of one of the most dangerous missions in history. The movie is based on the book by James R. Hansen, with a script written by Academy Award winner Josh Singer (Spotlight).